They say form follows function, which is certainly true in the case of Polaris Ranger XP 900. 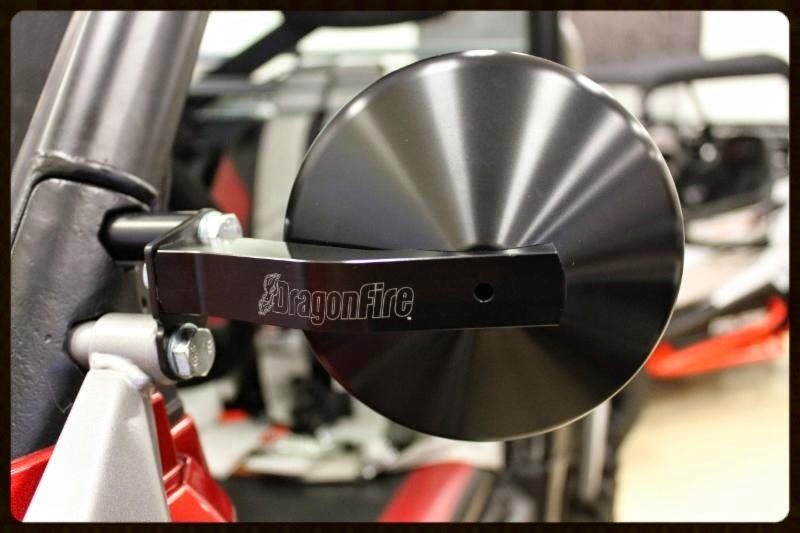 DragonFire has been on the gas, pumping out some amazing products for this machine. Recognized for its ability to work and respected for its performance, the Ranger XP 900 represents the ultimate cross-over. That’s why DragonFire has taken our Ranger product line to the next level! One thing we could see immediately was that the Ranger needed usable mirrors! We have adapted our wildly popular SS Mirror line to this vehicle. Inspired by our racing heritage, these side mirrors feature a nearly indestructible CNC billet aluminum housings with a push-to-adjust convex lens offering an extra wide viewing angle. Complete with a black anodized finish and laser etched DragonFire logo, these are not only the most usable but also most stylish mirror on the market for the Ranger XP 900. Who says you can’t have style in a workhorse? Broaden your view with DragonFire and boost your bottom line! Available with clamps for 1.75″, 2″ tube diameters or with flat mounts for us on Ranger 900 cages (see above part numbers for each style).